Happy to finally present the Unbounce annual year in review for 2015. A little late but better than never. I would say that 2015 was a real transformative year for us. We had some wins, some losses, many firsts, and lots of learning. It’s the year we started to have trouble remembering everyone’s names, when diversity at Unbounce became a discussion, when we started thinking more long term, a little differently – and more globally. We benefited from the Canada/US exchange rate in ways we never predicted and learned some valuable lessons from the challenges associated with rapidly adding to headcount. 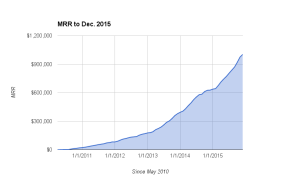 Let’s take a look at Unbounce in 2015. Averaged 83.12 Net Promoter Score for Support, 62.36 for Product. We had only one availability event related to serving hosted pages in all of 2015 that lasted 28 minutes, bringing our total page serving availability to 99.995% for the year. We had a number of smaller issues with respect to the Unbounce application, bringing us in at 99.987%. We had 54 new hires in 2015, and we also had 11 people leave us (more on that below), so a net new employee count of 43. That’s 57% growth. 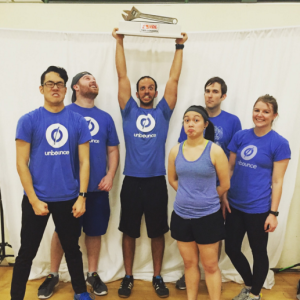 The Unbounce Dodgeball team, “The Dodge Grand Caravans,” won the local dodgeball championship. The year wasn’t without its growth-related challenges, some of which prevented us from retaining some really good employees. Operating a company of over 100 people separated by walls and floors (and time zones) is much more challenging than operating a 30-person startup with everyone mostly in the same room. Keeping everyone aligned and on the same page is hard during the best of times and in early 2015 it was probably our biggest growth-related challenge. By year’s end we made some progress and have resolved to communicate more often, use different formats, and repeat, repeat, repeat. This is an area that will require constant attention as we continue to grow. Properly integrating new employees (or existing employees into new roles) and setting them up for success was probably the second biggest challenge of our growth in 2015. The level of employee churn was not expected and as we dug into the causes, we learned some good lessons. Building on that, we’ve made employee success one of four key priorities in 2016. 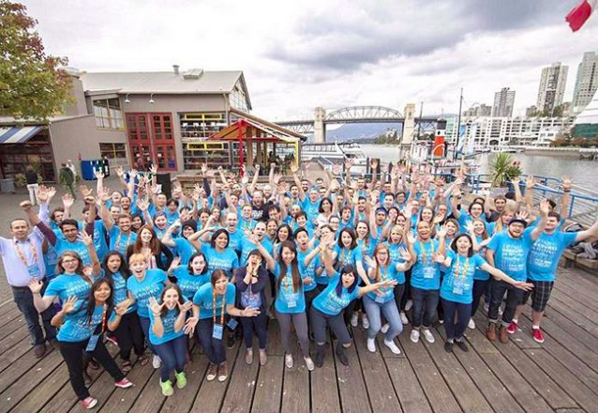 Last year I noted that when it came to gender diversity, Unbounce was about 40% female. I said we would do better in 2015 and we ended this year around the same 40% with less than 20% of the leadership team being female. This isn’t good enough and we know it. As we grow, we are looking for strong female leadership. In 2016 we’re looking to pick up our socks. We recently added two very talented directors who happen to be female. We also announced a parental leave policy. So much marketing. It was the marketing department that had the most growth in terms of people this year. Launched and hosted CRO Day — 24+ hours’ worth of exciting free webinars, Hangouts On Air, Twitter chats, AMAs, and in-person meetups. Chat – 14,199 chats with an average wait time of 25 seconds, which is up over 60% from last year for volume and an average of seven seconds faster. Tickets – 26,719 solved tickets with an average first reply time of 4 hours, which is up 40% from last year with an average of one hour faster reply time. Phone – 8,514 completed calls. Since we switched phone systems in the summer of 2014, I can’t do a direct comparison from 2014 vs. 2015, but if you compare August 2014 – December 2014 vs. August 2015 – December 2015, we saw a 41% increase in phone calls as well. We started the year in Customer Education with a pretty broad mandate to build content that would reduce churn. As a team, CS had focused almost entirely on “How-To” content that didn’t really answer the “why” our customers were asking for. As a team, our first need was a channel to share that kind of content. Hence, Unbounce Academy was born. Managing the build of such a large project (that was largely silo-ed from other projects at Unbounce) was tough – we had a group of people from different disciplines working toward the same outcome without a real framework for how that should look. Thankfully, we were blessed to have an awesome group of talented, patient people helping every step of the way. We realized that while the Academy was the team’s main channel, it didn’t define everything we did so we rebranded the Academy Team the Customer Education Team. The first goal of the Customer Engagement team was to hire dedicated Customer Success Managers that could cultivate strong 1:1 relationships with assisted accounts, help boost customer loyalty and ultimately ensure customers renew. At Unbounce, Customer Success Managers are responsible for driving customer adoption, growth, and subscription renewal. Having two CSMs, one focused on Marketing Teams and the other focused on Marketing Agencies, means we now concentrate our efforts on building meaningful relationships with two very different customer demographics. We added a lot of details and polished up the builder. This included everything from copy & paste, to fancy background styling to more custom fonts. Our builder is now easier to use! We launched an integration with WordPress! We made it easy to publish your Unbounce pages to your WordPress domain. No more dealing with CNAMEs and sub-domains. Acquired Rooster— exit-intent technology that helps convert abandoning visitors into leads, sales and signups. Our first acquisition of a product and team that sets us up for product expansion in a big way! Templates: Launched 44 new templates in the app, made 118 new user-created templates available for purchase at ThemeForest and launched a partnership with Template Monster who now provide 10 templates. Today we have a well-respected brand in the marketing technology space. Yet if there was one lesson we learned in 2015, it is that what got us here may not get us there. There is so much more we can and should do. Since 2010, we’d been laser-focused on what we knew worked, and improving on that. 2015 was the year that we began to explore new opportunities and embarked on three major new initiatives help our customers be even more successful. Unbounce is now used by people in more than 98 countries and 25% of our revenue is generated from non-English speaking countries, yet we’ve done little to proactively reach customers in these markets. We have a long-term goal of fully localizing our business for high growth markets. In 2016, you can expect us to double down on our international efforts, focusing on Spanish-speaking countries (Spain and LATAM), Brazil and the German, Austrian and Swiss region (DACH) in particular. You can expect marketing content and customer support in German, Spanish and Portuguese. On top of that, we also have plans to support local currency and alternative billing methods. We historically didn’t rely on a sales function because the ARPU of the smaller businesses we were attracting was not enough to provide ROI. As our product evolves, we’ve encountered lots of customers with more complex needs and a more complicated buying process. A sales function will help us better convert this portion of our market. In other words, we are now an attractive solution to a customer segment with a higher ARPU, which makes a sales effort a profitable and scalable way to grow the business. Speaking of laser focus, we have been on the following mission since day one: Give marketers indispensable tools and resources to easily create high-converting landing pages for every campaign. One of the things we have heard time and time again is that our customers love using Unbounce for their targeted campaigns, but they also wish they could use us to drive more business value on other web properties like their website and their blog. Towards the end of 2015 we took a significant look at our mission and the opportunities ahead of us, and have made a big commitment to expand our product beyond landing pages. We want to help marketers convert visitors into customers at all touchpoints, not just on their landing pages. Taking this into account, and some of our other strategies, we have a new, broader mission which is more in line with the original vision for Unbounce: to educate, connect and empower marketing teams and agencies to grow their businesses with the best conversion tools on Earth! Our product roadmap this year is ambitious and exciting. If you want to get a real in-depth look at what we have in store, including how we’re looking at leveraging machine learning and some other R&D efforts, watch this Google Hangout on Air AMA that our Chief Product Officer, Carter Gilchrist and CTO, Carl Schmidt did to kick off the year. In wrapping up I want to say that I’m amazed at what the team has accomplished to date. I’ve never worked with a group of people who are so committed to the success of our customers, and to one another, like the people I work with at Unbounce every day. We’ve got big challenges ahead and lots to learn but I’m willing to bet that the 2016 year in review will be the best yet by far. So until then, thank you for reading.